This article featured in healthbenefitstimes.com. Camelina oil is abundant in sterols, which are shown to inhibit with cholesterol absorption. In one research, it was shown that adding camelina oil to the participants’ diet reduced blood cholesterol levels. Camelina was twice as effective when compared to olive or canola oil. Camelina oil can be used as massage oil for the skin. Due it has a nice mild aroma, it feels good during the massage. It offers ample amount of Vitamin E and omega fatty acids directly to the skin. These moisturize the skin and prevent it from free radical damage. One can massage regularly to get healthier, smooth and well moisturized skin. Camelina oil can be used just like olive oil for a hot oil scalp massage. This provides nutrition to the scalp and gets rid of dry skin, dandruff and flakiness. It helps to keep the hair looking soft and moisturized. Its antioxidants protect the hair shafts from free radical damage. Camelina oil lowers blood triglyceride levels. This is good for cardiovascular health as it reduces the risk of heart diseases. Camelina oil can be applied topically to reduce inflammation in arthritis. When taken internally, it provides large amounts of omega â€“ 3 fatty acids. Regular intake of omega- reduces overall inflammation. One can experience a reduction in pain, inflammation and swelling over the joint. It also boosts mobility in the joint. Camelina oil can be used as carrier oil. It goes well with rosemary essential oil and this combination can be massaged on the inflamed joint. Foods rich in omega-3 fatty acids, like alpha linoleic acid, EPA and DHA are helpful in keeping the brain, eyes and nerves healthy. As a result, camelina oil may protect against cognitive diseases, like dementia, Alzheimer’s, eye diseases like macular degeneration and nervous damage due to inflammation. 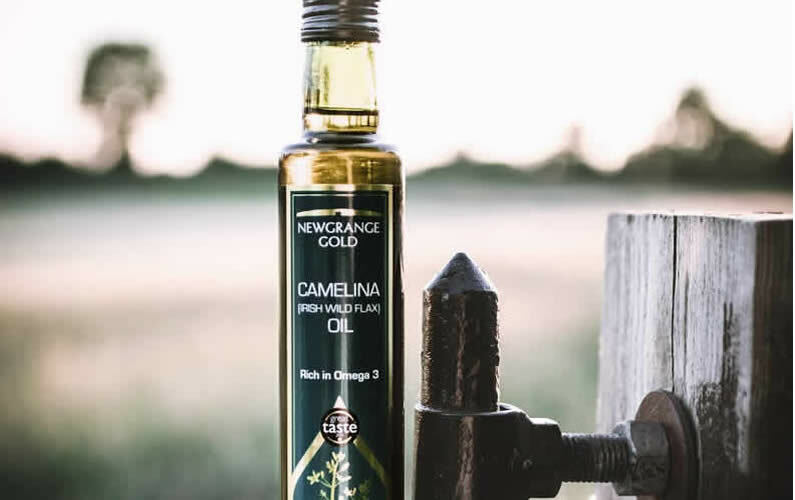 If you suffer from chronic pain or from an injury, camelina oil can be taken internally as well as used on the skin to work as an anti-inflammatory. This can also work on arthritis pain, something omega-3s are great for! Camelina oilâ€™s antioxidant content makes it perfect for helping out your immune system. Omega 3s and antioxidants are perfect to combat aging in any form, not just the skin. Keeping your brain healthy with essential fatty acids such as omega 3s is so important. This could decrease your risk for getting Alzheimerâ€™s or dementia in addition to cognitive decline. Camelina oil is loaded with vitamin E which is an antioxidant. This helps to make sure that the oil doesnâ€™t easily go rancid/oxidize. When this happens to oil it creates free radicals which can harm the body. This often happens when oils are heated. The high amount of vitamin E in camelina oil helps to make it more heat stable than some other oils on the market. Vitamin E when consumed is also very beneficial for our health because it helps to prevent many illnesses like heart disease and cancer. It has a fantastic fat profile. Camelina oil is loaded with omega-3 fatty acids. This is great news because most people are deficient in omega-3. In the Standard American Diet we are consuming high amounts of omega-6. Itâ€™s important to have a good balance between the two. Consuming enough omega-3 in our diet helps fight inflammation, prevent heart disease, improve brain health, etc. Camelina oil has some more interesting uses. There is growing interest in camelina oil as cooking oil, especially for deep frying. It has the highest smoke point of 475 Â° F which is much higher than olive, coconut, canola, grape seed and most other cooking oils. That is why one can use it for stir frying, deep frying and sautÃ©ing. Camelina oil has a nutty flavor, which makes it excellent for fried food and other delicacies. Camelina oil is a popular ingredient in paleo recipes. Camelina oil is also a source of fuel. It is being studied for its viability as an alternate fuel. It has been used as a jet fuel on number of occasions. In Japan, it is being studied for its potential to generate electricity. Camelina oil is also used as a nutritional supplement for dogs. Camelina oil is very resistant to both rancidity and oxidation. It has an amazing shelf life of about 18 months and even up to 24 months. So, it really goes for a long time. One can easily get cold pressed camelina oil which is purely organic, although it is slightly pricey. Camelina oil is extracted from the Camelina sativa oilseed. Camelina sativa is an ancient oilseed crop that is a member of the Brassicaceae family and is native to Northern Europe and Central Asia. Camelina was grown and consumed in Europe until the 1940s when higher yielding crops became more available. Currently, it is cultivated in Canada, the United States, Slovenia, and Italy. However, there are only a small number of acres being grown worldwide. Camelina oil can be used as cooking oil, in salad dressings, and in spreads and margarines. While it is able to withstand frying temperatures, is it not recommended that camelina oil be heated for prolonged periods of time. The oil is high in omega-3 and omega-6 fats, as well as vitamin E. Thus, it is ideal for salad and margarine oils.